The TurboTax Blog > Tax Tips > Dude, Where's My Refund? It’s tax season again and many people are asking the proverbial tax question, “where is my refund”? 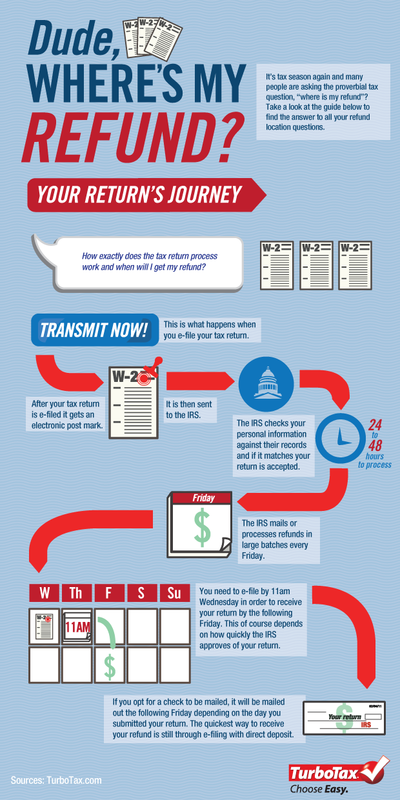 Take a look at the guide below to learn more about how the tax refund process works. The IRS is the definitive source to help you track your Federal refund. To learn more about how tax refund work, click here. TurboTax says my state and federal were submitted and approved but when I log into IRS.gov it says it was received but not yet approved and CA.gov says it haven’t received anything and acts like it’s never heard of me. I’d post screen shots of this ridiculousness if I could. So who’s lying here? Trying to figure out why I never received my turbotax card! I filed in February. Supposed to get California refund – efiled Mar16. The response was “We are processing your return at this time. Please allow 12 weeks from the date you mailed your return to complete processing. If we make adjustments to your return, we will notify you by mail.” That was certainly worth $20 for efile. I could have walked the return there. I filed my taxes with turbotax on jan 27 i had recieve date from the irs for feb 14.Didnt recieve my refund then.So i checked the irs website again they told me that it was in process.So 2 weeks ago i got another date mar 27.So now its mar 25 i checked the irs website again it says it back in process again.i’ve been waiting on my federal taxes for 2 months.I need some direct answers when am i going to get my refund.im tired of going to diffrent websites. I filed my tax return on 4/15 and it was accepted by the IRS, here it is 3/22 and I have not received my return. What is going on? I have been on the “where’s my refund site” and all its says is “Your tax return has been received and is being processed.” I was told it would take 10-21 days to get my refund, but its been more than 21 days. I filed both my state (MO) and Federal returns on 2/11/12 and received notice that both were accepted on 2/12/12. I received my state refund 4 days later and WMR indicated I should receive my Federal refund between 2/24-2/28. Now it just says “We have received your return and it is being processed.” It’s a short form filing with only a slight change in income (+/-$1,000). Why would it take this long? Should I be contacting my local IRS office? I filed threw turbotax and my refund suppose to be direct deposited onto my card but wheres my refund gave me a date but it does not states that my refund is going to be direct deposited. So will it be on my card? It’s not a scam. Due to the increased amount of fraud industry wide, TurboTax unfortunately had to put additional security measures in place to protect our customers. Please see this message regarding the refund card: Due to a significant rise in fraud across the industry, Intuit has put in place more stringent fraud detection and prevention controls to help ensure that only legitimate cardholders receive the refunds they are entitled to on a TurboTax Refund Card. In a small number of cases, we regret that a hold on some cards may impact legitimate cardholders. You can go here for additional information (see Security & Fraud Prevention): https://turbotaxcard.intuit.com/support/faq_turbotaxcard.html. Please note that the support line included in this article may require some wait time. Please call the refund card department to get updates. I hope you get your refund soon. we filled on the second of march and the turbo tax said we would have it by the 24th and the irs website said the 28th and we still havent recived anything all the dates are the same what should we do?????? Sorry about the IRS delays you are experiencing. This is an industry-wide issue. Please see this blog post regarding the IRS processing delays as well as an FAQ from our support site. TurboTax uses the IRS refund cycle chart that is based on normal processing, but because of the IRS delays, dates have been changed in the WMR tool by the IRS, in addition the IRS stresses that the refund cycle chart is a guideline based on normal processing and dates may be changed. If your tax return was accepted you will hopefully receive your tax refund soon. Look for your card in the mail on or before February 28, 2012. Still haven’t gotten it, what do i do? When the IRS releases the funds to your Turbo Tax Card, when will it post to your account? The funds get sent to the bank as soon as the IRS releases them, but it can take up to 48 hours to appear on your card. Yes, refunds not put on the refund card will be issued by the IRS via paper check once everything is reviewed. Hi I also exiled my tax returns on Jan 24 and received acceptance confirmation Omg the 26 . I opted for dire t deposit andbthe projected date that is recieve it of Feb 8. I’ve tried all the numbers and where is my refund and now it says it has been accepted but still being processed….isn’t the 10-15 receival date the reason I paid extra to get direct deposit? Just wandering the status on my refund as to its way past due with no explanation or letter or anything??? The processing delays were due to unforeseen issues, however you were not charged extra for direct deposit. Don’t worry, if your tax return was accepted you should receive your refund soon. my refund was accept on the jan.25,2012. i still havent receive my refund it was suppose to be on turbo tax card feb.14 was the problem?? Due to a significant rise in fraud across the industry, Intuit has put in place more stringent fraud detection and prevention controls to help ensure that only legitimate cardholders receive the refunds they are entitled to on a TurboTax Refund Card. In a small number of cases, we regret that a hold on some cards may impact legitimate cardholders. You can go here for additional information (see Security & Fraud Prevention): https://turbotaxcard.intuit.com/support/faq_turbotaxcard.html. Please note that the support line included in this article may require some wait time. Turbotax is very dissapointing. I have not yet received my card, which I was due to receive the 7th-9th. My money has been deposited onto the card, so pretty much TurboTax is making some interest off of my return, while I’m falling behind on bills because the guarentee that if I paid extra for the card would ensure I got my money quicker. Many many many other people are experiencing this issue along with many others relating to filing with TurboTax. Also don’t get me started on the 1800 number, everytime I call I have to wait at least 40 minutes for anybody to pick up, then I hear them say that they are “reviewing” my account. I’d like to know what they are reviewing, because the IRS has already accepted everything, and I have already gotten an email saying my TurboTax card was sent out the 30th of January. this makes no sense to me, and I don’t understand why I am getting NO answers, this seems very illegal to me. Michael, I have been going through the same thing since February 10th. My money was deposited on February 7th so I was told there was a security hold on my account and needed to fax them my information and it would be released within 5-7 days. Well here it is 18 days later and after calling every day they finally decided to tell me that my fax was never received and I need to fax it to their new fax number. I’m very disappointed and frustrated. My refund was accepted on Feb 2nd and today is Feb 16th, and the IRS site says that it does not have any information about my refund. Will I still get a refund even if the site doesn’t have any information? Please call customer service for the card 800.543.9160. I am the blog editor and I do not have access to the card information. Our returns were accepted, and we were told by IRS we would have our money by the 14th, but their written estimate says the 15th. This is through direct deposit, and we still haven’t received our money. I am starting to get deeply concerned. What time are deposits normally made. Your site says Friday. Will it happen Friday? if you have any info on my refund ? If you call them up and request a check they sulhod not charge you a Cash Advance Fee. However, with the time it takes to process that it might be better to just keep it on there and have it used as a credit the next time you use your card. However, if you go to an ATM or bank and get cash that way you most likely would be charged the fee. I submitted my taxes on 2/4 and they were accepted on 2/6. It is now 2/15 and they aren’t in my bank account nor has “where’s my refund” provided me any insight (it always tells me that I am not in their system; same with the state-level taxes). Is there a new refund chart available? I ran into this one – “http://yhtax.nicwebdesign.com/2012%20IRS%20Refund%20Cycle.pdf” – but since it is not straight off the IRS website (that hasn’t been updated since 1/23) I’m hesitant to trust it. I’d like to schedule things like doctor’s appointments and car tune-ups, but I can’t without even a decent estimation. Has anyone that filed their taxes on 2/4 received their refund? Thank you and sorry you are experiencing a delay. You may want to try calling them because my refund was deposited onto my card on February 7th, I waited until February 10th to call Turbo Tax to find out why I hadn’t recieved my card and then was told that there is a security hold on it and to fax them my personal information and it would be released within 5-7 days. Well here it is 18 days later, and finally after calling every day and getting no answer as to why they still had a hold on my card, they said that they have a new fax number that I now have to fax all my information to again before they will release my funds. I like how my post was deleted. This is a joke. I am sorry if there was an error. We do not delete posts unless they contain profanity or are strictly an advertisement or spam. What was your question? I filed the 30th an got an email saying my turbotax card had been sent in the mail. I can never get ahold of anybody due to high call volume. And my money has Bren put on my card already. Today is day 11 that the card hasn’t come. I’m getting impatient. i was supposed to get my tax turbo card between the 26th and 29th , its now the 31st and i still havent received it . whats going on ? The IRS is experiencing processing delays. Please see the explanation from the IRS on this post. The IRS is experiencing processing delays. Please see the IRS explanation at the bottom of this post. the IRS refund cycle says my refund should be deposited on 2/1 (it was accepted on 1/21) and that is what turbo tax says- but wheres my refund says by 2/7…which is correct?? Thank you for contacting TurboTax. The IRS is experiencing delays in processing some federal tax refunds due to changes in their systems. As a result, the original estimated federal refund date provided to you by TurboTax or the IRS may have changed. Your state tax refund is not affected. The most updated information is available through the IRS “Where’s My Refund?” tool, https://sa2.www4.irs.gov/irfof/lang/en/irfofgetstatus.jsp. Make sure to wait 72 hours after your return is accepted by IRS before you check your refund status. We understand your tax refund is important to you and we are actively working with IRS to ensure our customers’ refunds are processed as quickly as possible. If you REALLY want to be “smart” about it, don’t have so much tax withheld from your pay in the first place! A “decent” urefnd in my book is $0. Heck, I’d rather PAY when I file. That way the government is lending ME money, not the other way around that’s all that YOU are doing and you’re getting nothing in return for it either.If you went to Wally World and bought some stuff for $15 and gave the cashier a $20 and she told you that you’d have to wait until next April for your change, you’d go postal, right? Hell yes you would! Why then is it such a great deal when the GOVERNMENT does the same thing to you? Dumber yet, you AGREE in advance to let them do it to you. You ASK them to do it to you!If you get more than pocket change for a urefnd then you’re doing yourself a disservice. If you had the proper amount of tax withheld in the first place, you’d be current on your credit cards or be ahead on them even. The interest you would have saved could have EASILY been as much as HALF of whatever urefnd you are looking at given the credit card rates often charged to college students!If you’re carrying any credit card debt, pay that off FIRST. That’s a rate of return of between 35% and 75% right there.You want smart? You just got it! Hi ….My refund has been accepted by the irs. Both turbotax refund card and the irs say i should have my refund today…do you know when i will see it posted to my card? It only includes them if you didn’t reviece RAC last year. If you just used the card from a previous year for the direct deposit purpose then you’ll get it on the card. This is my first time using turbo tax and i hope all goes well these are some scary situations.. I loved how turbo tax was easy to use but i hope that i too will not have the problems as others have.. i was accepted on 1-19-2012 and i hope that it will be here this friday 1-27-2012.. i have recommened this site to friends and family i just hope i dont regret it..
Hopefully you receive your tax refund within the IRS estimates, but if it is not received exactly on 1/27, please keep the above information in mind. Thank you for recommending our site! Hey Lisa i filed for paper income tax refund on 2/28/12 it was accepted 3/1/12 i herd for the paper refunds takes up to 6 to 8 weeks to receive my refund it is now 4/24/12 my tax payer said i should receive my refund 5/1/12 i was just wondering if that’s an accurate estimate date of my refund any information from you would be greatly appreciated even though i didnt file with you guys thank you. My refund is also a week late, one of the reasons for using Turbo was the quick refund…errr it’s been almost 3 weeks since it was “accepted” by the IRS. We filed 2/17, and had a refund date of 3/4, on 3/4 it changed to 3/8, then on 3/8, it changed to “in processing” with a 1301 code. After calling IRS, we were told it was being processed and due to the 2008 Home Buyer Credit which begins repayment this year, it will be hand-processed. There are apparently glitches in their computer system not allowing the returns to be processed automatedly. He said expect to receive the refund in SIX to EIGHT weeks! On another website, someone was told TEN weeks! No, there is no deduction for that. And in most cases the preipad costs are not included as deductions from the estate so if your estate’s value exceeds the exemption amount for the Estate Tax when you die it cannot be used to reduce the value of the estate and therefore the taxes due. Only excess costs not covered by the plan can be deducted from the value of the estate.Also, before spending money on those plans, be aware that they are a major souce of consumer complaints in many states. Check out the plan carefully with your state’s Consumer Protection Division before investing. Some things to consider are what happens if the funeral home offering the plan goes bankrupt or simply ceases to trade? Is the plan backed by a well-rated insurance company that will cover the costs or is your family simply out of luck?Another consideration is that many of these plans fail to take the ravages of inflation into consideration. One that will cover your costs if you die next week may be comparitively worthless in 25 years. Also your family will be stuck with dealing with the funeral home that issued the policy and won’t be able to shop around for the best deals. True, many grieving family members fail to realize in such stressful times that they can shop around and negotiate but it’s usually best if there are independent sources of funds that will allow them to do so.If you are young, in good health and tobacco-free a better option may well be a 20, 30 or even 40 year term life insurance policy. The premiums will be very low and the funds can be used by your loved ones to cover your final expenses along with other money to replace the loss of your income. Even if you are elderly and infirm there are insurance policies that offer sufficient benefits to cover burial or cremation costs at reasonable rates. It is not unusual for your state refund to take longer than your federal. I would give it a few more days and then contact the CA department of revenue, if you still haven’t received it. I filed my return with TurboTax on Feb 17th, it was accepted on 18th by the IRS with an expected deposit date of 4 March. I have checked several times on Where’s my Refund (IRS site) since then without change; however, today on the 4th it reads “reference number 1301”. They are processing and it does not give a date. What does this mean??? I CHOSE TO HAVE A HALF OF MY RETURN PUT ONTO THE TT DEBIT CARD. WHEN WILL I RECIEVE THE CARD. ALSO THE IRS SAID I SHOULD RECIEVE MY RETURN BY 3/15/11. I KNOW THAT DIRECT DEPOSITS ARE EVERY FRI. WHY IS THERE A DIFFERENCE IN TIME? I received my federal refund check over a week ago. California State website said my state refund was approved back on February 18th and I should receive my refund check within 7-10 days. I still have not received anything. When should I become concerned that it may have gotten lost in the mail? And who would I contact? My form was accepted 2-4. I can’t get ANY information from “where’s my refund”. This is ticking me off. Yes, as long as the IRS does not change your estimated refund date again you should have your refund deposited into your account on the 28th! The IRS where’s my refund says my return will be direct deposited on Feb. 28th does that mean it will be deposited into my checking account on Feb. 28th? Paying off credit cards is a great idea. A lot of pelope spend their money on foolish things and regret it later. I would say pay what you need to first, then buy yourself something or put the rest in the bank for when you really need it. You’ll feel better that you did and you didn’t blow it. It seems as though we will have to wait two extra weeks until we get our refunds. I had mine accepted on Feb. 16 and was supposed to get it today. When I checked the IRS website tool my anticipated refund date went from March 1 to March 8. With e-file and direct deposit, you usually receive your refund in 8-15 days. I would check the IRS Where’s My Refund tool, though, to find out the most up to date info on when the IRS estimates that you will receive your refund. I applied for my refund Feb 2, 2011 and had it direct deposit to my bank I was wondering when will i get it. I applied For My refund Feb 1 and had it put on the turbo tax card and My refunds were accepted by the IRS on Feb 2. I still haven’t received my card I want to know where is it?